APPLY FOR UNIVERSITY OR COLLEGE NOW! Our professional team is happy to provide FREE service and to help you get closer to your dream! Start your Higher Education in the United Kingdom with undergraduate, foundation, postgraduate and Top-Up programmes with daytime, evening, weekends options. Our offices in London and Birmingham open doors for all European and UK students from 18 to 60. 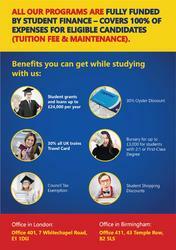 We will assist you with Student Finance application which may cover your tuition fees and living expenses up to £24,000 per academic year. Save yourself from Brexit and apply before April 2019 to get all the bonuses in UK!